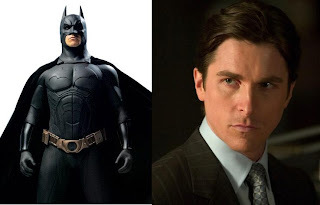 In Christian Bale’s movies he usually overcomes some fear. Of course, this happens in many films, but this theme is accentuated in Bale’s work. Batman Begins is the most obvious example: As batman he turned his fear into a weapon against criminals. In Empire of the Sun his childlike outlook on life helped him to continue functioning within a Japanese POW camp. His astounding confidence and optimism helped uplift everyone else in the camp. As Alfred Borden in The Prestige he had to overcome some astoundingly scary situations, including cutting off his own finger and sacrificing his life so his brother could live. He landed himself in a Vietnamese POW camp in Rescue Dawn, with a similar result as Empire of the Sun. His die-hard optimism made it possible for him and his colleagues escape despite the fear and depression hey had accumulated over the years. As John Preston in Equilibrium Bale had to overcome an entire society’s worth of twisted morality to restore his and everyone else’s humanity. As Jack Kelly in The Newsies he led a city-wide strike against the newspaper tycoons. I adored Bale's character in Equilibrium. It was a difficult movie to watch, but all in all, Christian Bale is an amazing actor, and you don't hear much about him, which is really good nowadays. check out Howl's Moving Castle too. He did the voice for the cartoons. I've liked a lot of actors. But nothing compared to my fanaticism on Bale. He is brilliant. The most potent fear any of his character has had to overcome, besides the one in Batman Begins, is Trevor Reznick's guilt so brilliantly and harrowingly portrayed by him in The Machinist. People always reduce his acting to the weight he lost, but that was just the physical part. What he does with the character is get under your skin, haunt you, just like Naomi Watts does in Mulholland Dr. These are incredible actors of our times.